In any single culture, the definition of what constitutes an extreme fashion may be agreed upon; but extreme fashion, like beauty, is in the eye of the beholder. Particularly between Western and non-Western views there are very different ideas of what is excessive or outlandish, or verging on the unacceptable. The most common denominator of fashion considered "extreme" is exaggerated broad shoulders and wide skirts, or small waists and small feet. It is possible to make the general statement that in Western Europe the body is usually amplified or reduced by the application of a garment or accessory, while in some African and Asian cultures, the body is permanently altered, and the alteration often augmented by accessories or garments. As Harold Koda states, "There is no doubt that much of the material has a multitude of meanings and intentions: displays of status, wealth, power, gender, cultivation, ceremony, and group affiliations" (p. 11). An extreme fashion may, and most likely does, perform more than one function simultaneously. Ragnar Johnson points out that any type of body adornment is rarely, if ever, purely utilitarian, and the form that adornment takes depends on a variety of factors, from the resources available in a particular society to the relative social standing and aesthetic tastes of the individual. Permanent body alteration, which is more common in African and Asian cultures, has traditionally held a negative connotation in the West, with the relatively recent exception of tattooing. The word "mutilation" is often used to describe any lasting modification to the natural body's appearance. To mutilate is defined in Webster's dictionary as: "to deprive … of a limb or other essential part, to disfigure, or make imperfect." Since the latter part of the twentieth century, however, publications have elucidated these traditions and have begun to erode the notion that dramatic permanent alterations are forms of deviant or perverse behavior. The culture of study and criticism of extreme fashion is probably as old as extreme fashion itself. The European clergy were active in their criticism of fashions that distorted or exaggerated the human silhouette. A fifteenth-century source criticized stiffened skirts for their ability to deceive the viewer as to the fullness of a woman's hips, and therefore her suitability as a child-bearer. Travelers recorded non-Western fashions as soon as the Age of Exploration commenced by the late fifteenth century. For the Western fashion historian, the corset is perhaps the first example of extreme fashion that comes to mind. Stiffened underbodices were worn by women from the 1400s through the early twentieth century. 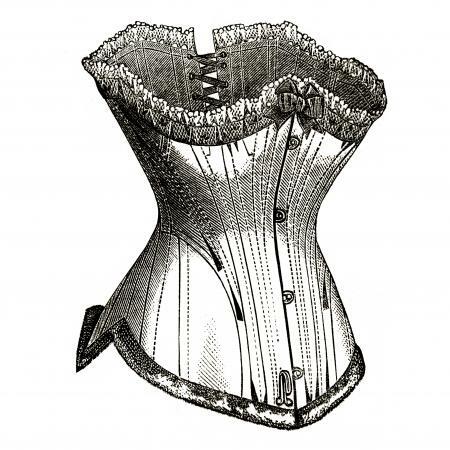 The corset, or "stays" as they were also called, was condemned when incidents of "tight-lacing," to make the waist appear as small as possible, began to appear. In that form, it was seen as deforming and detrimental to women's health almost from its inception. However, not all societies value a diminished female waistline; in Japan the waist is emphasized but not minimized with the obi-a wide sash of contrasting fabric-wrapped over the kimono, and tied at the back with an elaborate knot of huge proportions. The exaggerated skirt appeared in the form of the round sixteenth-century farthingale, the wide eighteenth-century pannier, and nineteenth-century hoopskirt or crinoline. All of these skirt shapes in their largest forms could prevent a woman from moving freely. In her classic study of undergarments, Norah Waugh surmises that upper-class women could afford to be more physically burdened by fashion, as they were not required to be active, as in battle. This premise has led to a situation where women's fashion is more often criticized for its extreme manifestations in Western society, but men have participated in extreme displays as well. The pleated collar known as a ruff is one example of a style worn by both sexes in Western Europe, notably at the court of Elizabeth I. It developed from a simple embellishment of the collar and grew to the cartwheel proportions evident in portraits of the late sixteenth and early seventeenth centuries. The face-framing function of the ruff was appreciated by men and women alike. The most commonly remarked upon body modification of Eastern cultures is certainly the practice of Chinese footbinding. Feminist theorist Andrea Dworkin suggests that footbinding and other body "mutilations" (quoted in MacKendrick, p. 3) may contain an element of romanticized tolerance of pain that signals the participant's character. In the case of footbinding, which is only performed on women, it may signal the willingness of women to endure the pain of childbirth and other forms of self-denial, as she is rendered unable to walk on her tiny feet. While a long, slender neck has been valued in the West, the practice of elongation of the neck reached exaggerated proportions among the Paduang people of Burma. The wearing of metal neck rings, increasing in number over time, forces the collar bones down, giving the illusion of a longer neck, and the rings are worn constantly to further decorate the exaggerated area. Piercing of the ears has become entirely acceptable in Western society, but in numerous African cultures the pierced hole is manipulated to accept larger and larger accessories. This practice is notable in Ethiopia, where piercing is only the beginning of a long process of stretching either the earlobes or the lower lip in order to receive further decorations, known as labrets. The advent and acceptance of cosmetic surgery has brought permanent body modification to mainstream Western society. Generally the results are not meant to be extreme, or even noticeable, but the possibility of dramatic alteration has been explored. Bodybuilding can be pushed to the extreme as well. Two genres of extreme fashions have developed in the twentieth century: fashions that are deliberately provocative or unattractive, and those that are intellectually challenging. In the 1970s, the punk movement, with Vivienne Westwood as its leading design creator, set out to provoke shock with its mix of overt sexual display and aggression. In the 1990s, the work of the Japanese avant garde was seen as unintelligible in the accepted fashion vocabulary. Rei Kawakubo's 1997 "Lumps" collection exemplifies the intellectual challenge to either renounce or alter traditional ideas of beauty. "Although one zone may be the focus of a period or culture, any extreme intervention is often accompanied or balanced by other manipulations of the body's proportions," notes Koda (p. 11). No matter how outrageous or extreme a garment or accessory is, it does not function in a vacuum and is stabilized by the other zones of the fashionable body. Johnson, Ragnar. "The Anthropological Study of Body Decoration as Art: Collective Representations and the Somatization of Affect." Fashion Theory 5, no. 4 (2001): 417-434. Koda, Harold. Extreme Beauty: The Body Transformed. New York: Metropolitan Museum of New York, 2001. MacKendrick, Karmen. "Technoflesh, or 'Didn't That Hurt?'" Fashion Theory 2, no. 1 (1998): 3-24. Robinson, Julian. The Quest for Human Beauty: An Illustrated History. London, 1998. Rubin, Arnold, ed. Marks of Civilization: Artistic Transformations of the Human Body. Los Angeles: University of California, 1988. Rudofsky, Bernard. The Unfashionable Human Body. New York: Doubleday and Company, 1971. Waugh, Nora. Corsets and Crinolines. London: B. T. Batsford, Ltd., 1954. Reprint, New York: Theatre Arts Books, 1970, 1991. Wilcox, Claire. Radical Fashion. London: Harry N. Abrams, 2001.